When Kraus-Anderson decided to redevelop its headquarters, it had several choices. It could redevelop he same space in similar fashion—with its HQ surrounded by surface parking. It could decide to relocate to a different location. Or it could stay in its current spot and truly make an impact on its neighborhood that will redefine its surroundings. With encouragement and support from the community, it chose the latter. The Kraus-Anderson project completely transformed its block in a way that exemplifies the feel of the new East Town community. The project incorporated a mixed-use philosophy that brings downtown business, residential, visitors and entertainment together as one. Because of how it is impacting downtown Minneapolis, the Kraus-Anderson Block was selected as one of this year’s 2025 plan leadership award winners. It will be recognized on October 2 at the mpls downtown council annual gala. Kraus-Anderson’s project at 8th Street and 5th Avenue made several improvements to the block that fit into the 2025 plan’s goals for creating an extraordinary downtown. The Kraus-Anderson headquarters is a fresh facility that not only kept KA’s footprint downtown but also brought additional workers into its office under one consolidated roof. The KA headquarters is a 100,000-square foot campus. 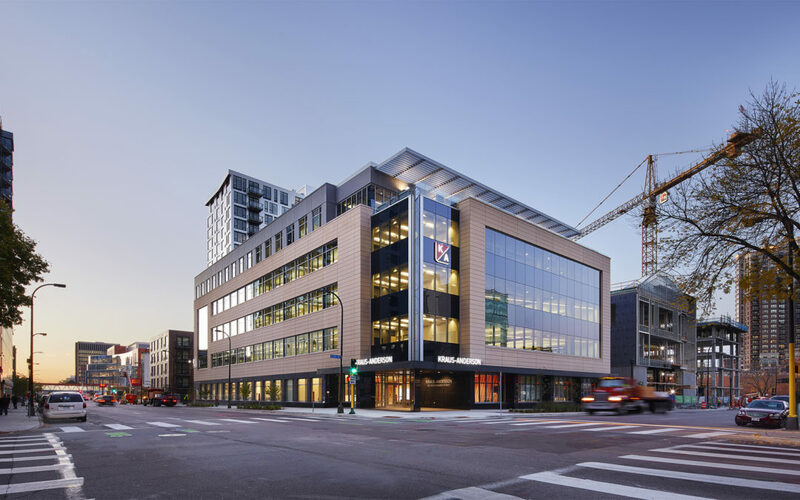 KA has headquartered in downtown Minneapolis since 1897, and the new headquarters holds about 300 employees—doubling the previous downtown staff. A new apartment complex was added to the block. Called The HQ, it is a 17-story, 307-unit, amenity-rich apartment building along the Portland Avenue residential corridor. The apartment ties into the 2025 plan’s goal to double the downtown residential population by the year 2025. The Elliot Hotel, an eight-story, 168-room Marriott Autograph boutique hotel, will add to the visitor experience in the downtown community. It also includes a restaurant, Tavola Kitchen and Bar, on the first floor. FINNEGANS House, an innovative four-story, 43,500-square foot production brewery, taproom, Brewer’s Den Social Club and innovative “Finnovation Center” for social entrepreneurial ventures is located on the block as well—adding to the downtown experience of the area. The Kraus-Anderson Block is a revolutionary idea that brings downtown business, residential, visitors, dining and entertainment all together on one block. The vision for this block aligns perfectly with the 2025 plan’s goals.